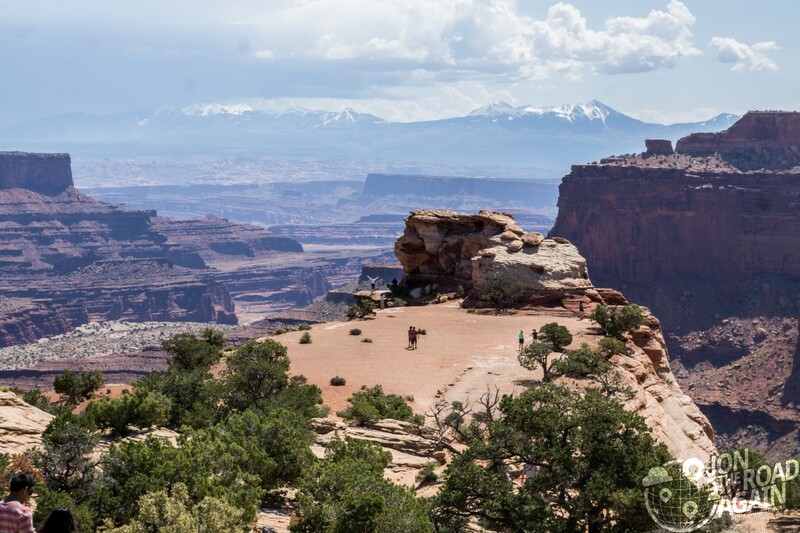 Canyonlands National Park: Island in the Sky is an expansive park near Moab. Yesterdays visit was to Arches, which is about 120 sq. miles in area. 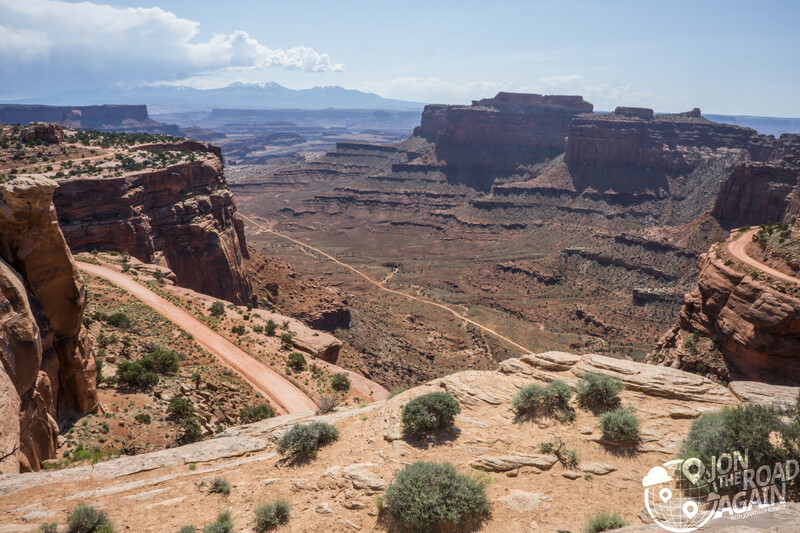 Canyonlands, by comparison is 527 miles of rugged Utah terrain. It has two main areas. The most popular and largest visitor area is Island in the Sky to the north and the other (also breathtaking) area is The Needles which is smaller and nearer the southern part of the park. We visited both. Let’s start with Island in the Sky. We’ll see The Needles a few days from now. 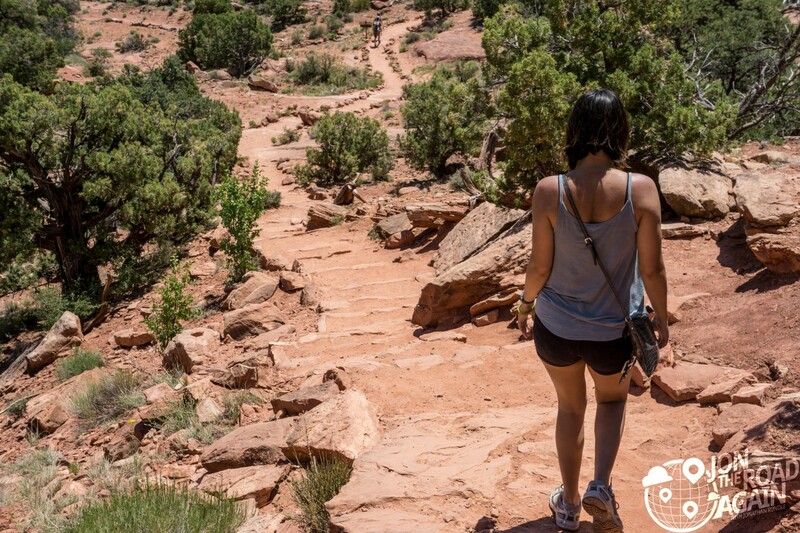 The Island in the Sky mesa rests on sheer sandstone cliffs over 1,000 feet above the surrounding terrain. 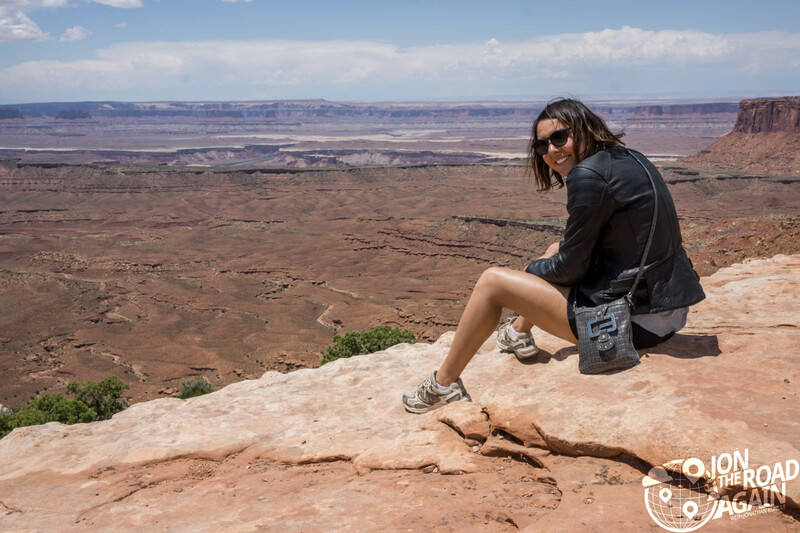 Every overlook offers a different perspective on Canyonlands’ spectacular landscape. 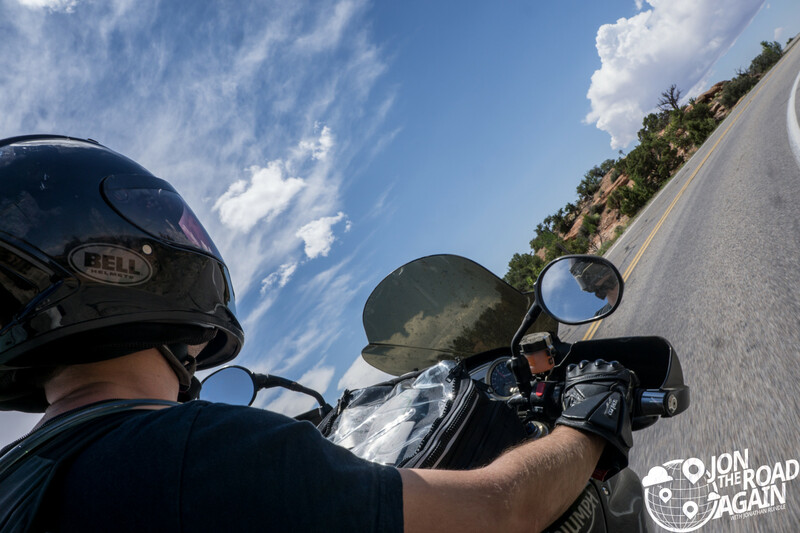 Island in the Sky is the easiest area of Canyonlands to visit in a short period of time, offering many pullouts with spectacular views along the paved scenic drive. That road heading down into the canyon floor is the Shafer Trail aka Shafer Canyon Road. The road was a filming location for Thelma and Louise. Nearby is Thelma and Louise Point, which marks the spot where they (spoiler) plummet to their presumed deaths at the end of that movie. It’s a popular road for Jeep tours and mountain bicycling. Visitors to this area of Utah are probably motivated to see as many arches as possible, I know I am. 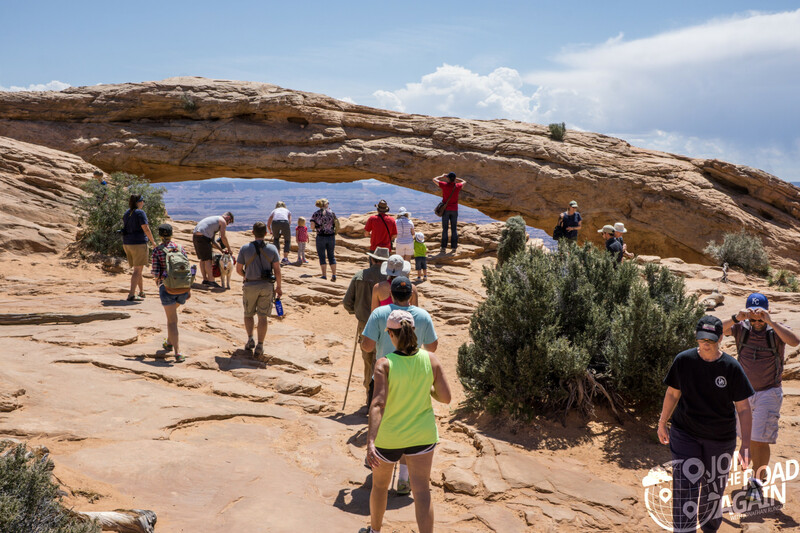 It’s an easy hike to Mesa Arch—which means expect lot of foot traffic on this trail. Let’s hop off the bike and take a walk! 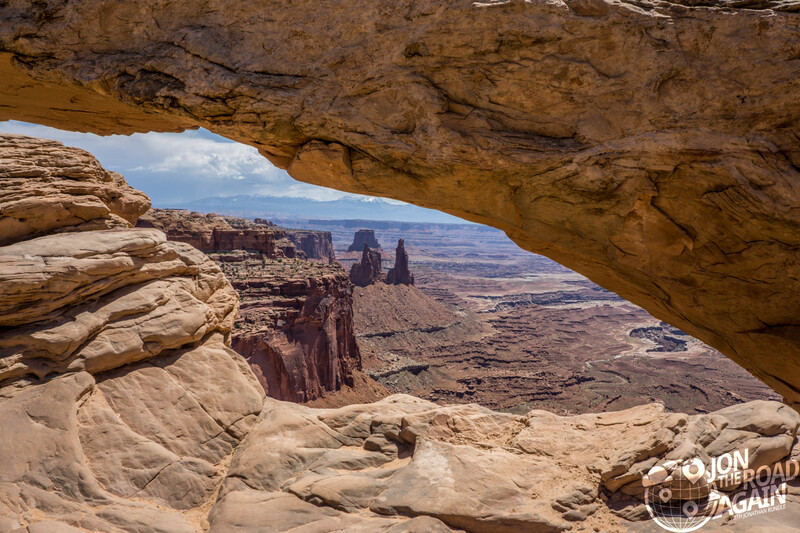 Below: Mesa Arch with Shafer Canyon and the La Sal Mountains in the distance. I had to get in close to capture this view through the arch. Take a few steps back and you get a good photo of the crowd! 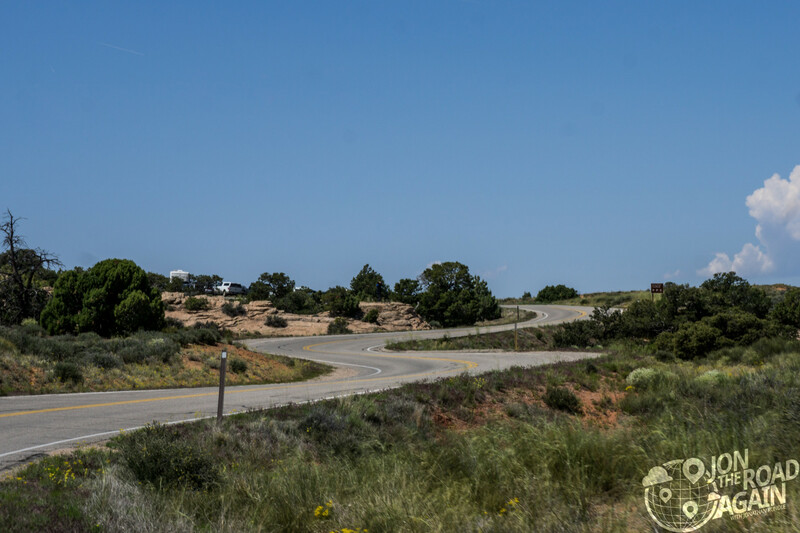 As with Arches, the road here at Canyonlands National Park: Island in the Sky was immaculate and surprisingly twisty. I suppose they could have carved straight through this stretch, but they added all these little turns. Presumably there to slow down vehicle traffic, the twisties are a welcome sight for those of us on two wheels. Those two wheels also help with the parking situation. By mid-day these parking lots are full of vans, rental cars and RVs. 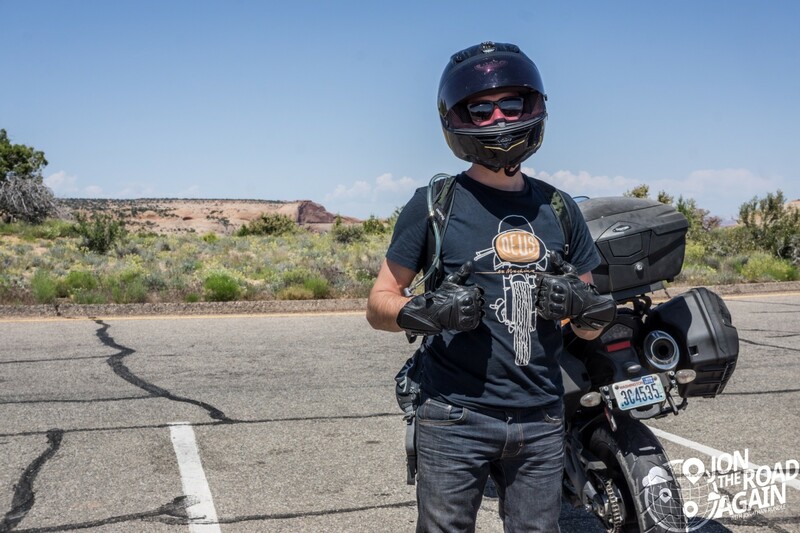 As a motorcycle, you can park right by the trail head and never worry about finding a spot. 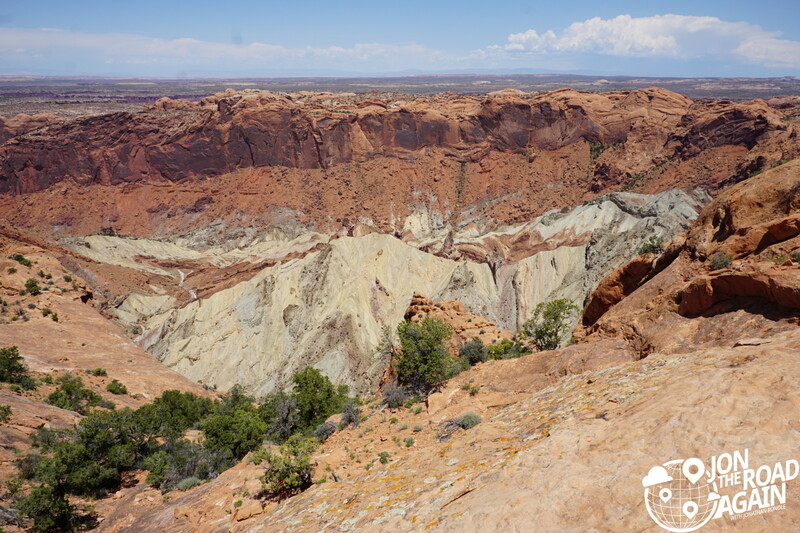 Upheaval Dome is a curious geological stand-out compared to the rest of Canyonlands. Here, rock layers are dramatically deformed. In the center, the rocks are pushed up into a circular structure called a dome. Surrounding this dome is a downwarp in the rock layers called a syncline. What caused these folds at Upheaval Dome? 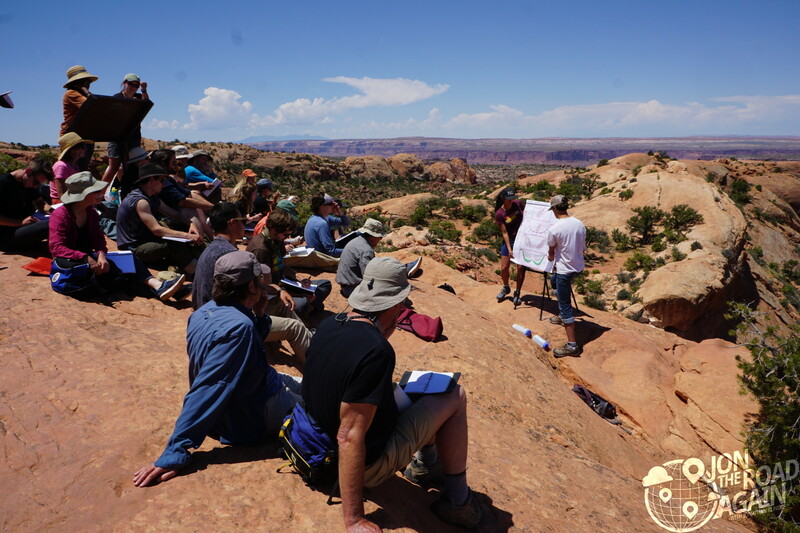 Geologists do not know for sure, but there are two main theories which are hotly debated by geologists everywhere and by this group of budding geologists which were holding class at the site. 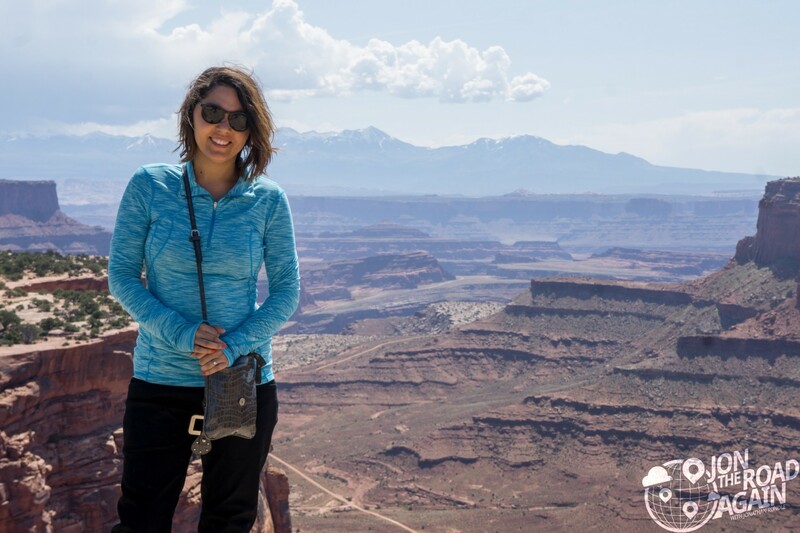 A thick layer of salt, formed by the evaporation of ancient landlocked seas, underlies much of southeastern Utah and Canyonlands National Park. When under pressure from thousands of feet of overlying rock, the salt can flow plastically, like ice moving at the bottom of a glacier. In addition, salt is less dense than sandstone. As a result, over millions of years salt can flow up through rock layers as a “salt bubble”, rising to the surface and creating salt domes that deform the surrounding rock. If true, Upheaval Dome would earn the distinction of being the most deeply eroded salt structure on earth. Some geologists estimate that roughly 60 million years ago, a meteorite with a diameter of approximately one-third of a mile hit at what is now the Upheaval Dome. The impact created a large explosion, sending dust and debris high into the atmosphere. The impact initially created an unstable crater that partially collapsed. As the area around Upheaval Dome reached an equilibrium, the rocks underground heaved upward to fill the void left by the impact. Erosion since the impact has washed away any meteorite debris, and now provides a glimpse into the interior of the impact crater, exposing rock layers once buried thousands of feet underground. Our next stop is at the Orange Cliffs Overlook. Here you can seemingly see forever perched on the edge of a cliff that will drop you into oblivion. Whitney smiles because she is fearless. Style points for rocking that leather jacket and shorts. 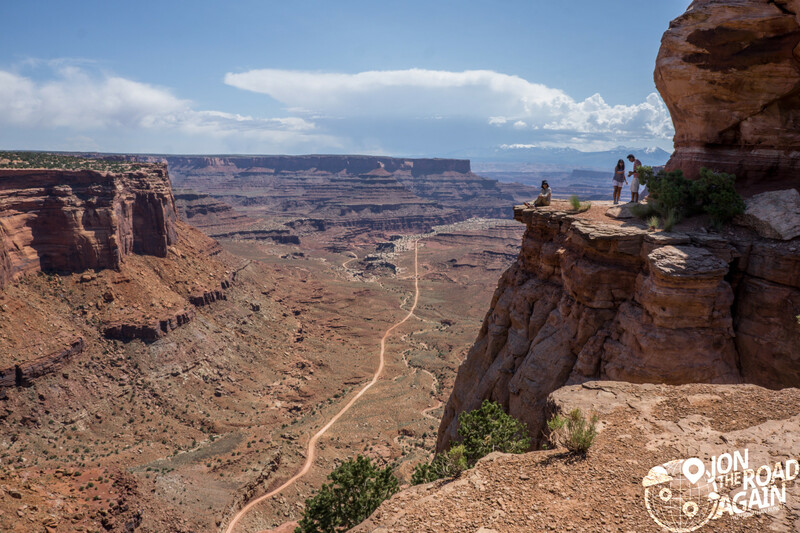 The farthest viewpoint in Canyonlands National Park: Island in the Sky region is the Grand View Point Overlook. Looking across from 6,800 ft., you can get an especially good understanding for how these canyons formed. As the Colorado Plateau gradually rose, rivers that once deposited sediment on the lowlands began to remove it from this raising area of land. 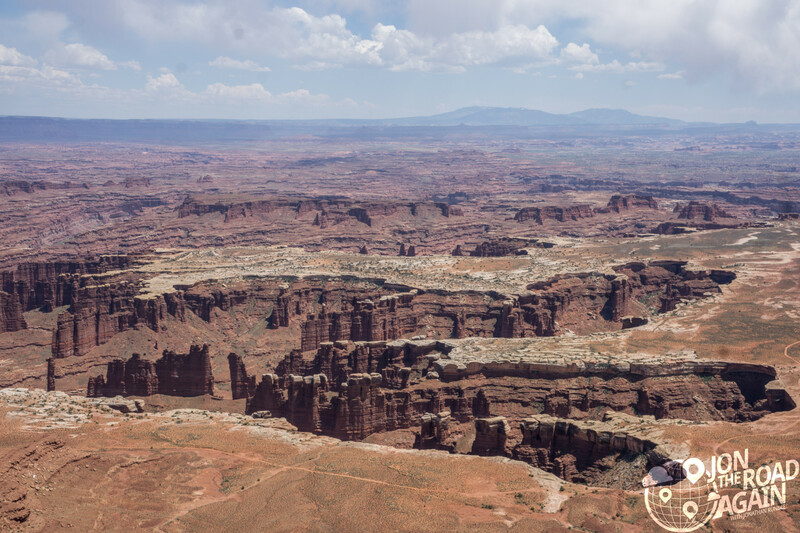 The Green and Colorado Rivers began carving into the geologic layers, exposing buried sediments and creating the canyons of Canyonlands. The areas that contain denser rock stayed (creating spires) and areas of softer rock washed away. Today rivers still slowly work their magic along with an assist from powerful thundershowers that pass through the area. The open are is known as Monument Basin. To the far left you have the La Sal Mountains and in the distance in the center is the Abajo Mountains. Out in the distance is The Needles section of the park. We visit that section next.